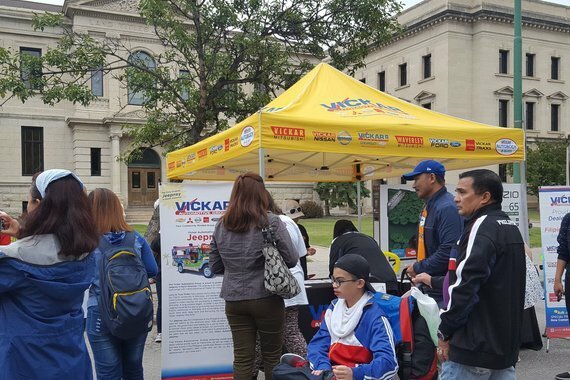 The Vickar Automotive Group are proud friends and sponsors of the annual Manitoba Filipino Street Festival last August 26, 2017, Saturday on near Memorial Park just across the city's legislative building. The 6th Annual Festival showcases the rich culture and highlights the increasing number of Filipino's in Manitoba. The Festival features an early morning parade similar to parades back in the Philippines, which involves showcasing the creativity of Filipinos through different parade floats. The event was graced with the festival's Queens and Princesses chosen last Tiangge ng Bayan at the Maples Sports Complex. The Jeep ni Vickar was present at the Parade and team members of the Vickar Automotive Group showed their Filipino pride and support to the Filipino culture by walking with the Jeepney during the parade and giving away some gifts for people watching by. The Jeep ni Vickar is the only Jeepney in North America and is a great representation of the Filipino culture here in Winnipeg; traditional Filipino dances were presented by various Filipino Organizations and traditional Filipino foods were showcased by various food trucks.